Chelsea make the trip to the Czech Republic to face Slavia Praque in the first leg of the Europa League quarter-final stage. The Blues have built up confidence with three wins on the bounce and they are certainly favourites for tonight's game irrespective of the expected changes in personnel. Kepa Arrizabalaga has been Maurizio Sarri's first-choice pick in goal for both the Premier League and Europa League duties and he is expected to feature once more between the sticks. In the defence, Sarri is likely to make changes from the regular backline with a view to the weekend game against Liverpool. Davide Zappacosta and Marcos Alonso could slot into the left and right side of the backline while Andreas Christensen could get another chance in the central defensive role alongside Antonio Rudiger. In the midfield, Jorginho is very much assured of his holding role, considering the lack of players within the squad with similar passing attributes. Alongside him, Ross Barkley and Mateo Kovacic may feature, meaning that N'Golo Kante and Ruben Loftus-Cheek could be afforded a breather ahead of the Reds game. In the attack front, Eden Hazard appears certain to be rested with Sarri confirming that the attacker has looked tired of late. 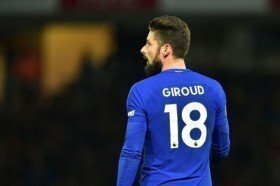 We are anticipating a complete overhaul of the frontline with Willian and Pedro flanking Olivier Giroud, who is set to lead the line ahead of Gonzalo Higuain.